Kepler has confirmed more than 1000 planets outside our solar system, but so far only a few of Earth-like size and in the habitable zone — rocky planets with just the right temperature for liquid water. And none of those potential Earth-analogues have been observed directly, but through the interpretation of astronomical data, such as the wobble of the star, or the dimming on the star’s light due to planetary transit. So far, some pictures of other planets have been taken from ground-based telescopes, but those planets are large, bright and orbit far from their suns — not like potential Earth-twins which will be far smaller and orbit closer to their suns. 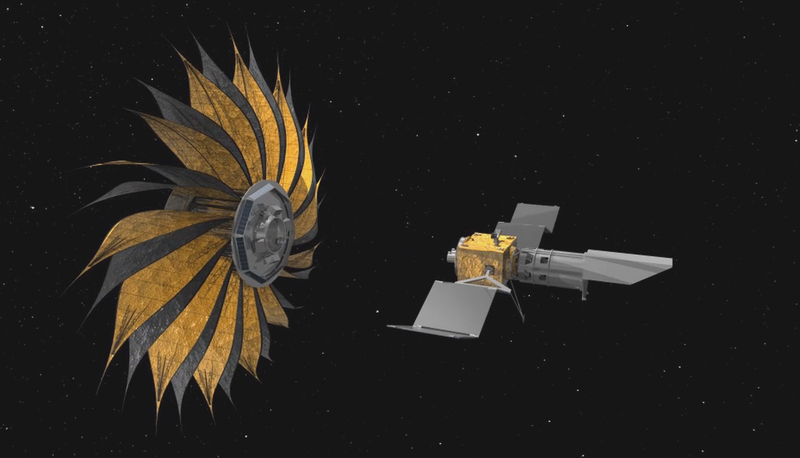 NASA scientists and engineers are working on two new technologies to help look for new planets, a starshade and a coronagraph, which will both work to block the light of the star, allowing the telescope to examine the reflected light of the planet itself. This means we can not only take pictures of prospective Earth-like planets, but also use spectrographic analysis to analyse what in their atmospheres as well. This will give us clues to what might exist there. For example, evidence of plant life and animals similar to those on our Earth would show up as a series of simple signature compounds in the planet’s atmosphere: such as oxygen, ozone, water and methane. A starshade is a type of spacecraft that actually flies in front of the telescope to block the light of the sun under observation. Despite the fact it will be only tens of metres wide, it will fly quite a bit in front of the telescope — in fact around 50,000 km away — more than four Earth diameters. Getting it into space is a challenge. It will be folded up like a super-origami prior to launch to unfurl in space, somewhat like an unwinding spring, into to a crazy-sized sunflower. The pointed petals are crucial to its design: they control the light the right way to reduce the glare to levels where planets can be seen. The petal-fringed shape creates a softer edge that causes less bending of the light waves. Both the starshade and the telescope will be independent spaceships, allowing them to move into just the right position for observations. The petals of the starshade need to be positioned with millimetre accuracy. Blocking out the starlight while preserving the light emitted from the planet is called starlight suppression. The light of a sun can be billions of times brighter than the reflected light from the planet. Our own sun is 10 billion times bright than Earth. Coronagraphs were originally introduced in the early 20th century to study our own sun, blocking out the light from the sun’s disk to allow scientists to study its outer atmosphere, or corona; hence coronagraph. They are much smaller than the starshade, located within the telescope itself. These starlight-blocking coronagraphs will be more sophisticated. These new generation coronagraphs uses multiple masks as well as smart mirrors that can deform, to suppress starlight in sequential stages. There are many other challenges in delivering the coronagraph technology, including being able to suppress or compensate for the warping and vibrations that all space telescopes experience.